A fifth round draft pick of the Padres in 2008, Anthony Bass made his major league debut in 2011 and quickly excelled, going 2-0 with a 1.68 ERA in 27 appearances. He kindly answered my questions about baseball cards. "Growing up I collected Cal Ripken Jr baseball cards. 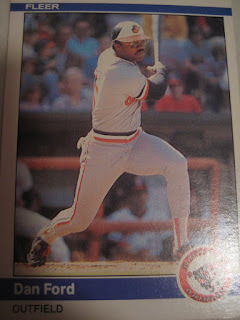 I was an avid collector of Cal Ripken growing up and also Cecil Fielder but nothing out of the ordinary. I have a large collection. I like them all." The number 2 draft pick of the Dodgers in 2008, Josh Lindblom made his major league debut in 2011 and quickly excelled, going 1-0 with a 2.73 ERA in 27 appearances. Off the field, he is the founder of the Josh Lindblom Foundation, which promotes awareness and raises funds for families and children in need. He kindly answered my questions about baseball cards. "I used to collect baseball cards when I was younger. My parents and grandparents would always buy me cards for birthdays. I used to only collect cards of my favorite players growing up Jeff Bagwell, Craig Biggio, and Ken Caminiti. I had two huge card boxes of every single one of their cards in them. I do no collect cards anymore. 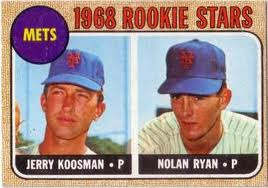 My favorite card is a Nolan Ryan rookie card with the Mets." 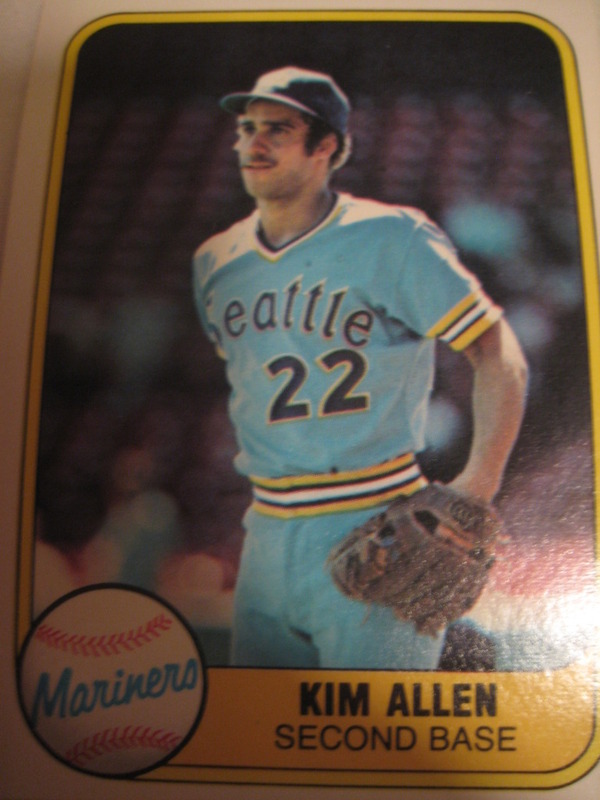 I have one card of Kim Allen, from 1981 Fleer. Playing career: Second baseman Kim Allen played in 42 games for the Mariners in 1980 and 1981, hitting .222 and stealing 12 bases. Where he is now: Anyone know what Kim Allen is doing now? Google Autocomplete results: Kim Allen is fifth when you type Kim A, between Kim and Kris Wedding and Kim and Kris Break Up, both of which refer to a celebrity couple. The ballplayer is fifth on the first page of results for Kim Allen, behind a love psychic, an actress, and a human development professor. Coming up next: The next profile will be Shane Andrews. I have one card of Ronnie Allen, from 1991 Classic Best. 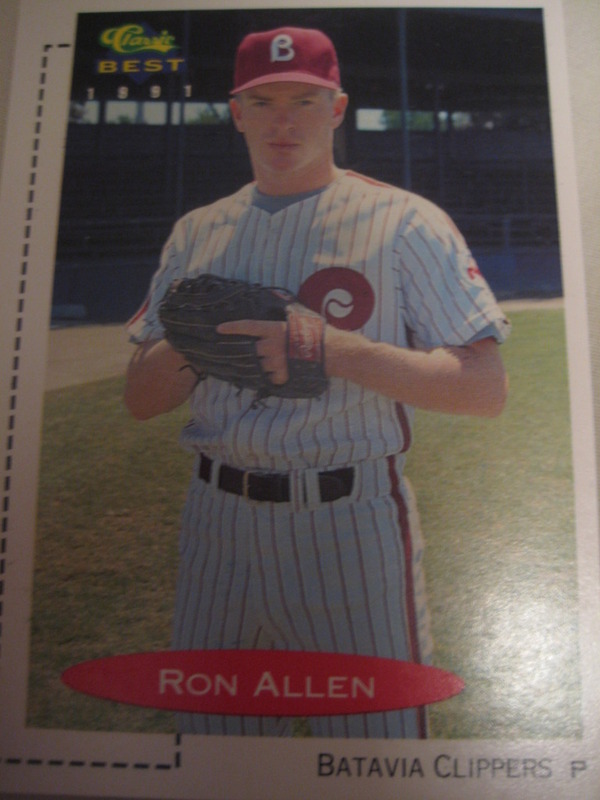 Playing career: The Phillies’ third round draft choice in 1991, Ronnie Allen spent four years in their organization, as well as another four games in the Astros chain in 1995. He was 23-23 in his professional career. Where he is now: A freelance photographer in Seattle. My memories: Never heard of him until I got his card. Google Autocomplete results: He is third when you type Ronnie Al, between Ronnie Almani, President of weddingbandswholesale.com, and Ronnie Alma, a graduate of North Babylon High School in New York. 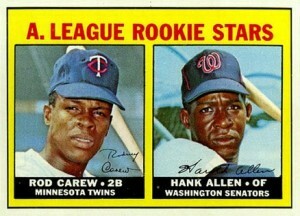 When you google Ronnie Allen you don’t get any entries for the ballplayer on the first page. Prominent Ronnie Allens include a singer and an English football (soccer) player. As someone whose collecting interests are very broad, it's fun to be able to help someone out who has a very specific collection. So I thought it was cool to be able to send Dodgers supercollector Night Owl some Dodgers he somehow didn't have yet. In return, he sent me some cards off my newly revamped want list, which, in addition to being easier to read, has more of my set wants, including sets I am near to completing in their own section. This great-looking Don Mattingly card is one of three he sent me from 1992 Fleer, leaving me with just two needs for that set - #6, Dwight Evans, and #710, Nolan Ryan Pro-Visions. 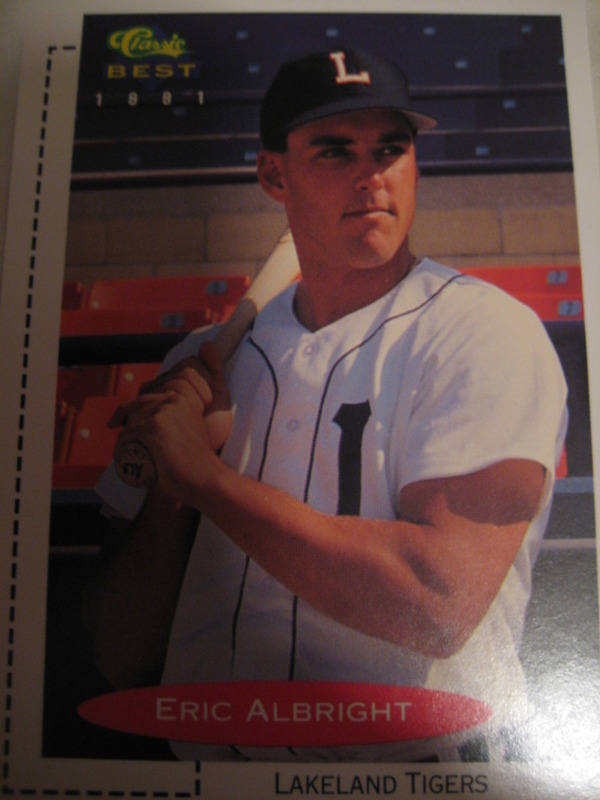 I have one card of Eric Albright, from 1991 Classic Best. Playing career: Catcher Eric Albright played four years of A ball in the Tigers system from 1989 to 1992, hitting .227 with 14 HR and 94 RBI in 225 games. Where he is now: Anyone know where Eric Albright is now? Google Autocomplete results: He is tenth when you type Eric Alb, after Eric Albarracin, a US Army Captain. There are no results for the ballplayer on the first page when searching Eric Albright. The other Eric Albrights include a doctor, an artist, and several college athletes. Coming up next: The next profile will be Ronnie Allen. Does anyone have 1986 Donruss Mookie Wilson (604) or Buddy Biancalana (605) to trade? I got the last of my sets in this week - a factory sealed 1986 Donruss set. Despite being factory sealed, it was missing cards 603, 604 and 605. I already have 603, but need 604 and 605. Anyone have either or both of these to trade? Dan Serafini pitched for the Twins, Cubs, Padres, Pirates, Reds and Rockies from 1996 to 2007. His best season was 1998, when he went 7-4 for Minnesota. Now the owner of the Throw Like a Pro Baseball Academy in Sparks, NV, he kindly answered my questions about baseball cards. "Baseball cards are great. I wish I did start collecting them when I was a kid. My silliest story is: the fact I didn't know that much about collecting baseball cards. 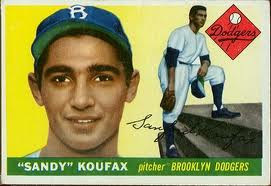 I used to pitch with Sandy Koufax's rookie card in my hat in high school! Little did I know it would be worth what it is today. So I have a nice beat up Koufax card and a bunch of my own from all the different leagues and countries I have played in." 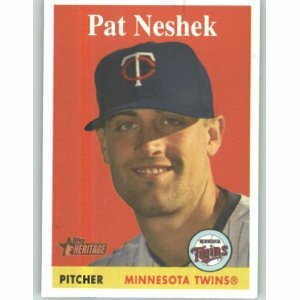 Pat Neshek came up with the Twins in 2006 and had a breakout season the following year, going 7-2 with a 2.94 ERA in 74 appearances. Injuries limited him after that but he bounced back in 2011 with the Padres, going 1-1 with a 4.01 ERA in 25 games. He is an avid collector who has most of his autograph collection posted on his own site, On the Road with Pat Neshek. It also has some of his stories about his own cards. He kindly answered my questions about baseball cards. "Favorite card is a 2007 Topps Heritage short print, I opened 36 boxes & never got one...had to buy it on eBay. I collect autographs (music, baseball), graded sets of 1970 topps, 68, 74 & 85. Also graded Garbage Pail Kids cards. Also collect single signed HOF baseball collection - 125 different guys, ttm & in person baseball/hockey autographs, and other historical autographs." Thanks! 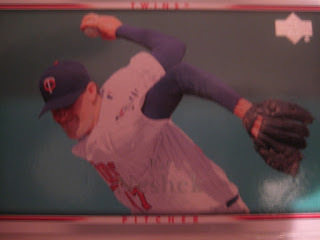 Here is a Neshek card I have, from 2007 Upper Deck. 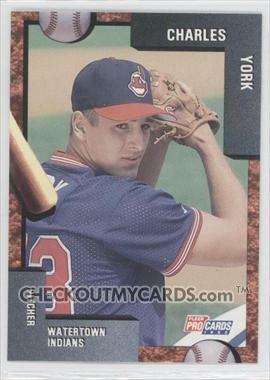 Charles York pitched in the Indians organization from 1992-1995, going 22-17. He kindly answered my questions about baseball cards. "I love baseball cards. I have a lot of them. I'm a big fan of old minor league cards, they are my favorite to look at." A first round draft choice of the Cardinals in 2006, Chris Perez was traded to the Indians in 2009 and has been their closer the past two seasons. This year he made his first All-Star team, saving 36 games, fourth in the American League. He kindly answered my questions about baseball cards. "I still collect cards. I have about 40 thousand. My favorite cards are any type of Topps/Bowman refractors, I like the way color hits them. I have over 200 hundred Frank Thomas cards, he was my favorite player growing up, so all of his cards I really enjoy. I also have over 300 cards I got autographed in person around the different Spring Trainings in Florida. My favorite card of mine is one of my first ones when I was on Team USA in '05 in college. Upper Deck made a set of cards and one had me and my college teammate Jon Jay on it, so that is my favorite personal card." Thanks! I couldn't find any pictures of that card (2005 UD USA Dual Auto) but here is one I have, from 2008 Stadium Club. Mark Parnell pitched in the Royals and Reds organizations from 1988 to 1992, racking up 80 saves while striking out 307 batters in 307 innings. Now the owner of Mark Pressed4Time, the country's leading dry cleaning pickup and delivery service, he kindly answered my questions about baseball cards. "I never made it to the big leagues, but have some minor league cards. My son likes them. They are only good for throwing darts for anyone else. The funniest story I have about baseball cards happened this past summer. When I was in AA Memphis, in 1990, a guy from my high school tried to get my attention to sign a card but I never heard him. The next day he came back and one of my teammates got a ball from him and passed it around the dugout. A few of the guys signed it along with me and someone named Babe Ruth. There were always jokers around. This guy found me on Facebook this summer and told me this story. He still has the ball and the story. I have a few cards. I do not really collect them but have some pretty good cards. Mostly guys I played with." Also, don't forget to check out the latest This Week in Baseball Cards at the Hall of Very Good. 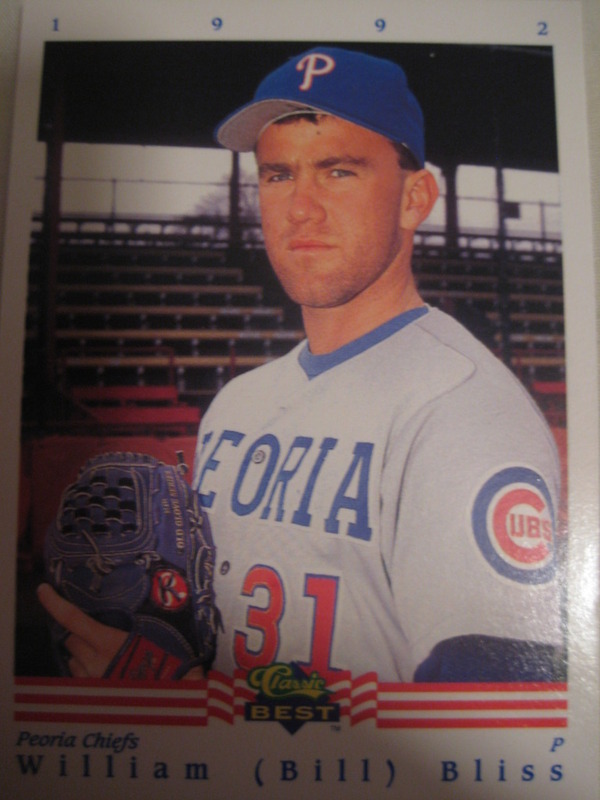 Bill Bliss pitched in the Cubs and Rockies organizations from 1991 to 1995, winning 13 games and saving 15. Now working for the MLB Players Alumni Association, he kindly answered my questions about baseball cards. "I loved the chance to be on all the cards I was on. It was a privilege. I have a rookie Rod Carew that is my favorite, and a Goose Gossage that he signed for me. I do not actively collect anymore, but I have about 200,000 at home.I would pretend to build teams and memorize the stats of players and use the cards.I would not worry about what they are worth or trying to make money. It was the window and possiblity in a picture to live a future dream." Outfielder Dan Ford played for the Twins, Angels and Orioles from 1975 to 1985. His best season was 1979, when he drove in and scored over 100 runs and earned an MVP vote in helping the Angels to their first AL West title. He kindly answered my questions about baseball cards with this brief comment. "Its good to have a card and I like all." The eighth round draft choice of the A's in 2008, Jeremy Barfield spent 2011 at AA Midland, hitting .257 with 11 HR and 72 RBI. The son of former Yankees and Blue Jays slugger Jesse Barfield, he kindly answered my questions about baseball cards. Well I definitely used to when I was younger. I had about 5 binders full of hundreds of cards each. They are all stored somewhere in my parents attic now. When I get a chance I will definitely have to go look through them. I'm sure I have something valuable in there. 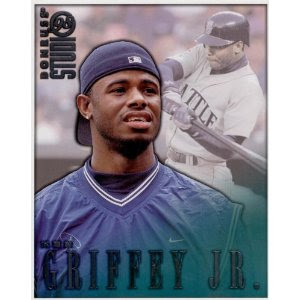 I remember in 1998 when I was 11 years old and my dad was coaching in Seattle that my favorite player in the whole world, and still by far my all-time favorite, was Ken Griffey Jr. I had just gone to the local card store and Donruss had just released these new 8x10 cards and sure enough in my pack I got a Griffey one. I was so excited. A few weeks later once school got out my family went to Seattle to be with my dad for the summer. I was so anxious to get the card signed, but at the same time I was nervous. I had been in the clubhouse before and talked to him plenty of times, but I had never asked for an autograph. My dad reassured me that one autograph is fine and sure enough Junior signed it for me no problem. I still have that card to this day. 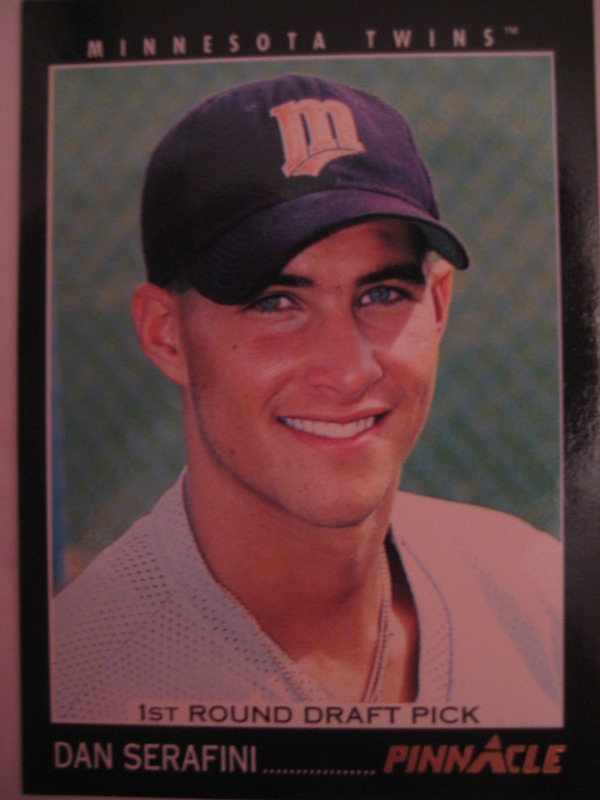 The 1998 Donruss Studio with Junior wearing his hat backwards. During the 2011 season starting about June I started seeing a new card of me. Up to that point I didn't have any Bowman cards. That's kind of disappointing considering it was my 3rd full season. So this card starts showing up every city I'm in and it has a printed autograph, so it was very weird signing my real signature on the printed one. The printed signature wasn't even how I sign my name, which was odd. Apparently Topps gets it from the $2 contract you sign when you first sign your pro contract. So all season long I was signing my real signature on top of my $2 signature with a picture they used that was over 2 years old! Better late than never I guess. So my favorite card of myself is definitely from the future because the only one I have now is and will never be it." Overally my Amazon gift card set buying binge has been a very positive experience. However, there was one seller on the "marketplace" who I would definitely recommend anyone buying baseball cards avoid - "The Bullpen," a store in New Windsor, NY. 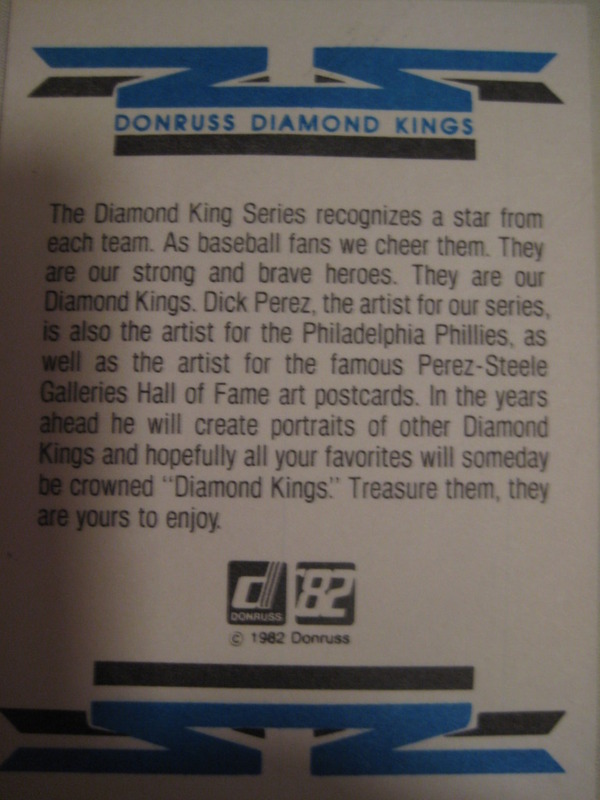 I ordered two sets from them - 1982 Donruss and 1986 Fleer. 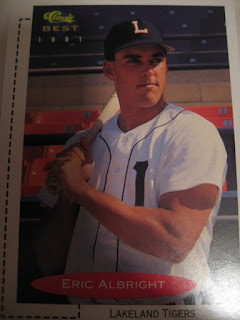 1986 Fleer has one major rookie card - the Jose Canseco rookie. Guess what one card just happened to be missing? Fortunately I happened to have that card from a recent trade (thanks Scott Crawford!) so I let that one slide. The other set I ordered was 1982 Donruss. Instead, I received 1982 Fleer. I had to send the box back to him to get the refund for the set, but didn't get refunded for either his shipping or my shipping, so I was still out $20 for his error. Amazon rules allow the sellers to do this, but a reputable seller would refund a buyer for shipping on their error. So, to sum up, I ordered two sets from this guy and got one set missing the key card and one set completely wrong, and lost $20 because he wasn't honorable about refunding shipping for his error. As baseball fans we cheer them. They are our strong and brave heroes. They are our Diamond Kings. . . .
Treasure them, they are yours to enjoy. Third baseman Matt Mangini was a first round draft choice of the Mariners in 2007, and made his major league debut in 2010. In 2011 he hit .336 with 2 HR and 41 RBI at AAA Tacoma. He kindly answered my questions about baseball cards. "Baseball card story of myself: my biggest card collector is my mom. She thinks it's fun to bid on my cards on the Internet even after I told her I could hook her up. Favorite card: I don't really have any favorite cards of myself but I remember I used to collect the all gold cards, I thought they were pretty cool. 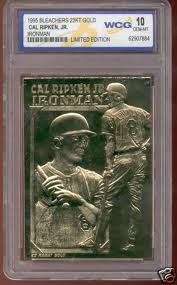 The Cal Ripken Jr Ironman Gem was my favorite. Do I collect: the only cards I collect now are of my teammates at every level, I usually get a few from each player and collect the team sets each year and get them signed, it's fun to look back and see all the good players I've got to play with." 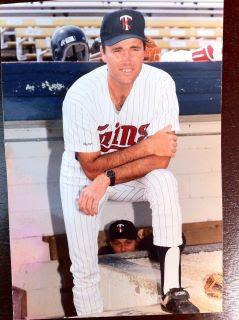 Bob McCreary, who played shortstop and pitched in the Twins organization in the early 1990s, and thus has a similar story to tell as his 1989 Elizabethton Twins teammate Tim Nedin, who I interviewed earlier this week. Now a social studies teacher and baseball coach with his own blog, Baseball by the Yard, he kindly answered my questions about baseball cards. Most guys take the card taking process in stride but some players take nothing seriously. Sometimes a player who bats or throws right-handed will pose as a left hander. A pitcher may pose with a bat in his hand or a catcher's mitt. Of course, the photographer has no idea what's going on so nobody notices it until the card comes out. Some players can get in trouble if they have equipment contracts. Let's say a player has a glove contract with Rawlings and is shown on his card with a Wilson glove. The company is obviously not happy and let's the player know it. My favorite card is probably my first card. I have about 10 different cards altogether but it is usually the first one that is most special. My favorite card of someone else is the one I attached to this email. It is of a former manager of mine who is now the major league third base coach for the Twins. Look between his legs. One of the funniest, craziest players I ever played with decided to work his way into the photo as a trick. The photographer went along with it. The coach obviously had no idea until he got his cards. I laugh every time I look at it. I have never been a card collector. The memorabilia side to the game never really interested me very much. I was just concerned with playing the game. Thanks! 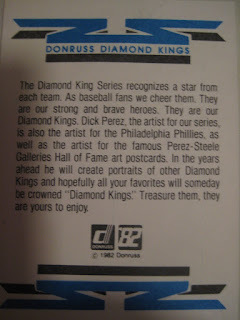 I don't have his first card, from 1989 Star, but here is one I do have, from 1991 Classic Best. Catcher Lucas May was the eighth round draft choice of the Dodgers in 2003. He made his major league debut in 2010 with the Royals. This year he split time between the Royals and Diamondbacks AAA teams. He kindly answered my questions about baseball cards. "I had tons of cards as a kid, and for some reason I always loved the "Dream Team" cards. There was just something about them! It's funny that my rookie card is of me breaking my bat. It's not the goal of hitting, but some people think it's the coolest thing ever."